This weekend at the market, the sweet potatoes were calling my name. I’m not quite sure why because they certainly aren’t the most handsome of vegetables but I brought them home only to realize that I had no idea how to prepare them. I certainly have eaten my fair share of sweet potato but for some reason have never made them myself. This called for some research time. I wanted to make a satisfying main dish with sweet potatoes, all with ingredients I already had in my kitchen. 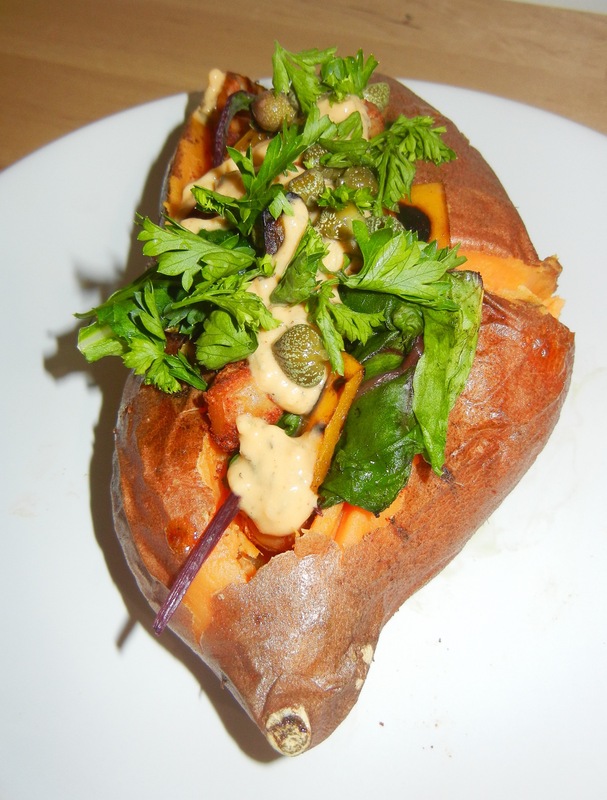 I started browsing and came across a great recipe which I modified to add some more veggies, change some seasonings, lightened up the oil content, and made them “stuffed” potatoes rather than just halves. I especially loved the change of extra sauteed veggies for even more crunch and the salty bite of the capers. The result was seriously delicious and a very filling (not to mention, super photogenic!) vegan dinner. Cut in half, these ‘taters would be great as a side dish as well. Scrub sweet potatoes, pat dry, and then poke it with a fork 5-6 times. 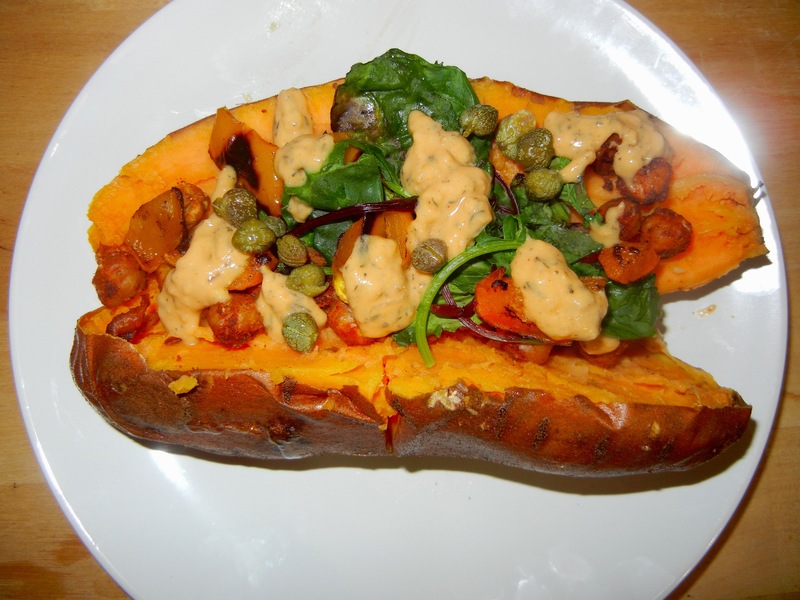 Spray or rub sweet potato halves with olive/coconut oil and place onto a foil lined baking sheet. Place sweet potatoes in the oven for ~45 minutes until tender. Rinse chickpeas and pour into a small bowl. Add in olive/coconut oil, spices and lemon and toss to coat. Spray or rub sweet potato halves with olive oil and place onto a greased or foil lined baking sheet. Place chickpeas on top of another foil lined baking sheet and place into the same 400F oven 25 minutes before it is time to take out your potatoes. 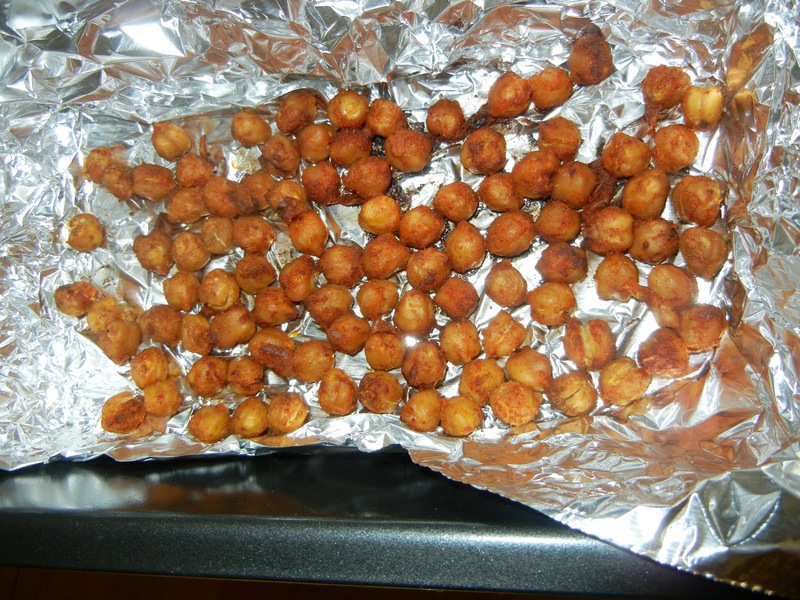 Remove chickpeas ~25 minutes when they are golden brown. While sweet potatoes and chickpeas are cooking, prepare the sauce. Combine all ingredients in a bowl, adding salt and pepper to taste. Dice bell pepper half and lightly saute along with dark greens and any other veggies of choice you would like to add (onions and carrots would work great here). Once sweet potatoes and chickpeas are ready, remove from oven. Slice large slits into each sweet potato to stuff them. 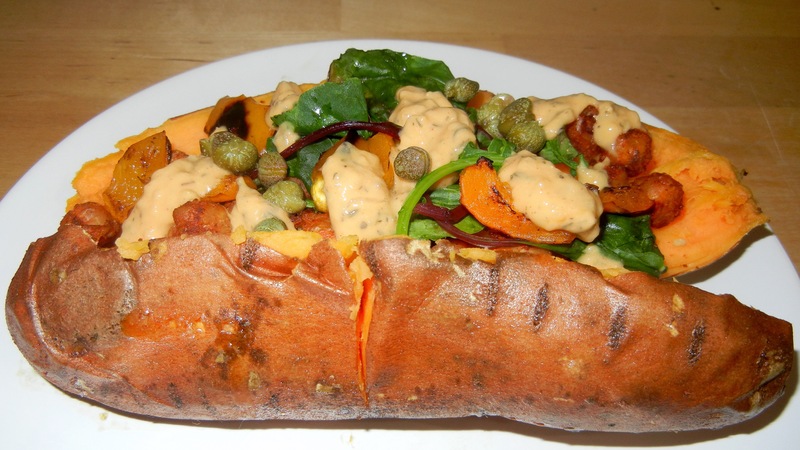 Serve sweet potatoes topped with chickpeas, sauteed veggies, hummus sauce and garnished with capers and parsley. How do you make a vegetable taste good? Turn it into a fry! How do you make ANYTHING taste good? Put cheese on it! I used to work for a dairy company and in every mini fridge were blocks of delicious organic cheese- completely free. (Although after getting almost run over by a cow that summer I think I deserved all the free cheese in the world but I digress…) Anyways, it took some serious willpower to pass by each kitchenette and not snag a slice, but instead I began to think of the myriad of ways in which I could incorporate cheese into a balanced recipe. These crispy, cheesy green bean fries are delicious combination of crunch and salty cheesy bite. 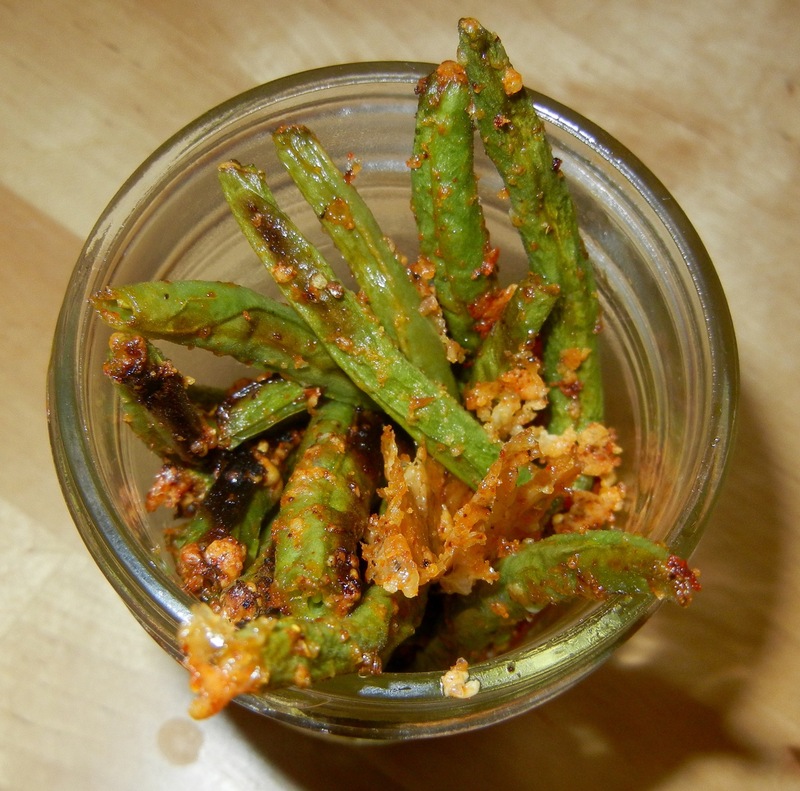 Great as a snack or side dish, they are perfect for both the picky eater and vegetable connoisseur. Serve as is or even dipped in some organic ketchup for an authentic fry experience. Cut ends of green beans. 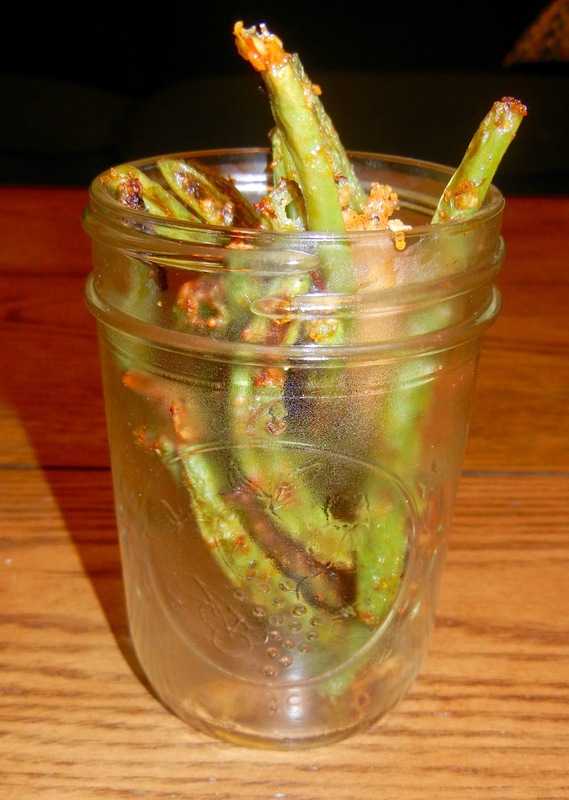 Place trimmed green beans in a bowl and drizzle olive oil. Toss to coat green beans with the oil. Add all spices and cheese to the bowl and again toss to fully coat. 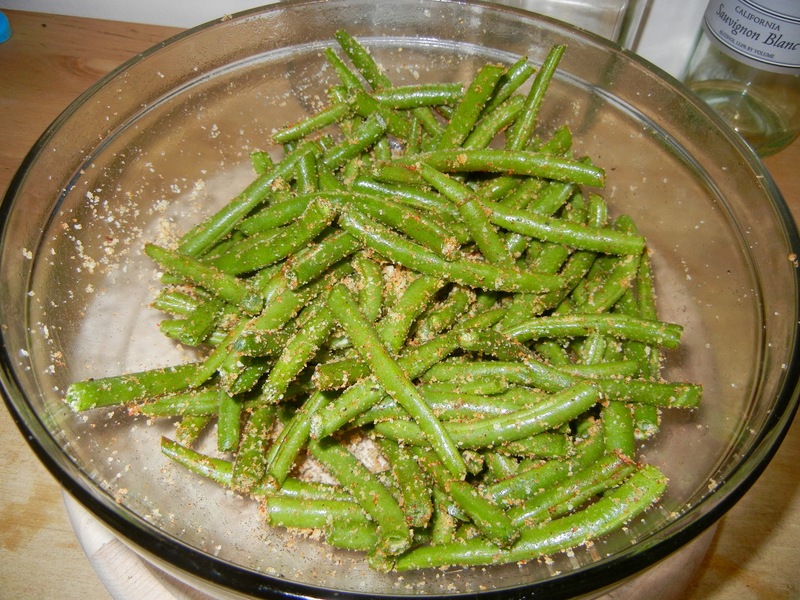 Place green beans onto a baking pan/dish, making sure they do not overlap. Bake for 10-15 minutes until golden brown. Next, broil for 2-3 minutes for especially crispy green bean fries. Sometimes my best recipes come out purely out of an effort to use up the contents of my fridge. I was in the mood for something quick and healthy, yet comforting and delicious all at the same time. I had some veggies I wanted to use up before leaving for the weekend so I just began roasting and blending and the result was super tasty (all the while I got to feel like a mad scientist in the kitchen)! 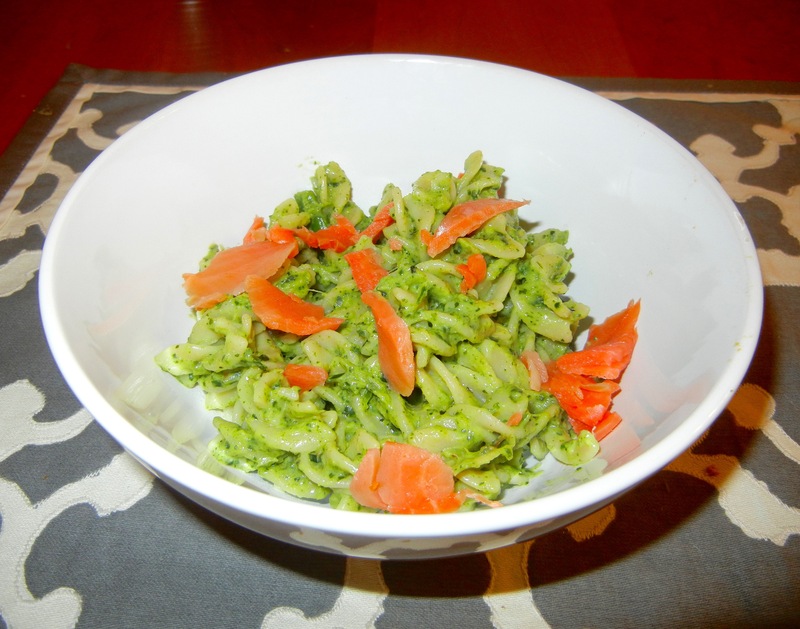 This recipe creates a great stand alone dip for veggies or crackers, but combined with some gluten free pasta, it makes a creamy and nutritious sauce. I chose to serve mine topped with smoked salmon for extra protein and a salty bite. 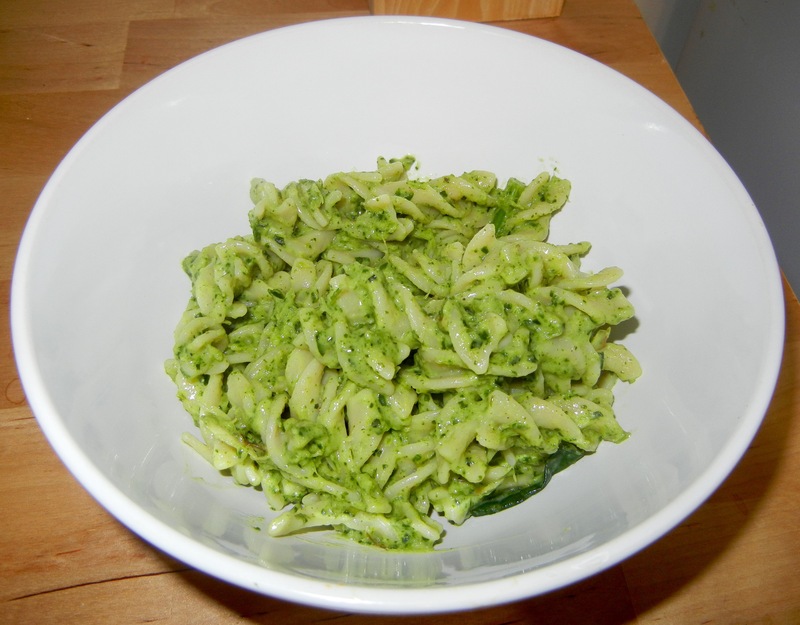 It is perfect for a filling and simple Sunday night dinner or for any night of the week. Preheat your oven to 400F. 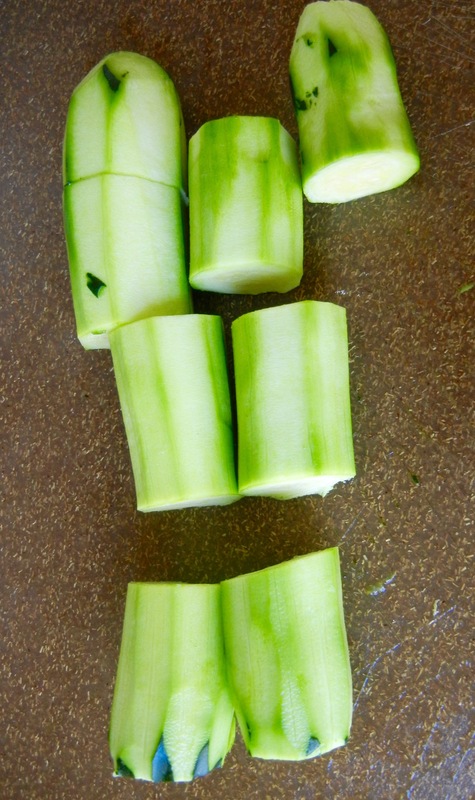 Slice zucchini into ¼ inch strips and cut your half onion into chunks. Peel the cloves of garlic. Grease a baking sheet with olive oil. Place zucchini and onion onto the baking sheet and either spray or drizzle additional olive oil. At this time you may also place the garlic on the baking sheet for a roasted garlic flavor. Place baking sheet into the oven for 15-20 minutes until veggies are lightly browned. Meanwhile, steam 3 cups of kale. Place kale, Greek yogurt, zucchini, onion and either roasted (or not roasted) garlic cloves in the blender. Add salt and pepper to taste. Blend until fairly smooth but leaving some small vegetable chunks. To make the pasta dish, simply use your pasta of choice and prepare according to package instructions. Once finished, reserve about ¼ cup of pasta water. Strain pasta and pour into a large bowl. Add in your desired amount of sauce and slowly pour in pasta water while stirring until desired consistency is achieved. Optionally, top with smoked salmon. Great served with my vegan garlic cauli mash! 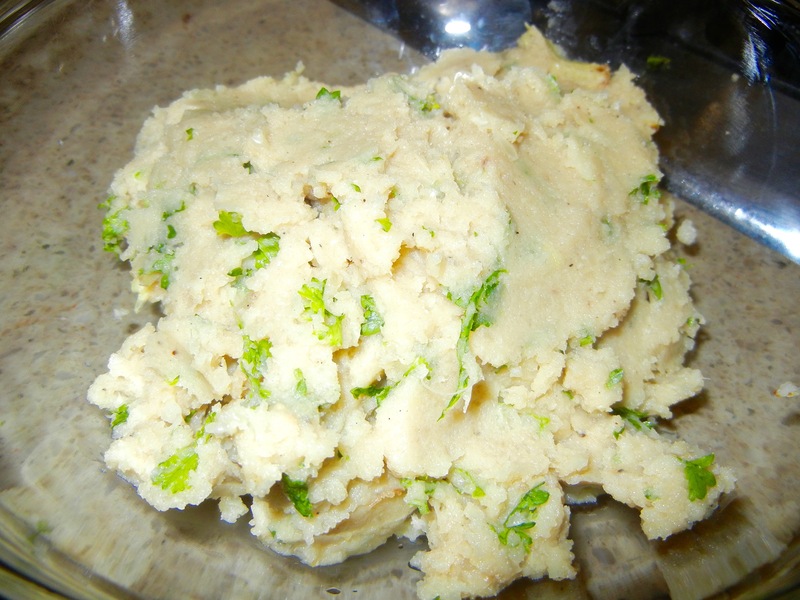 The idea of cauliflower mash is great. Replacing potatoes with a low carb, high nutrient vegetable is a dream come true. However, I’ve noticed that either this swap is so bland and completely unsatisfying, or there so much butter/sugar/cream is added to the equation that it defeats the purpose of making the healthy switcharoo in the first place. 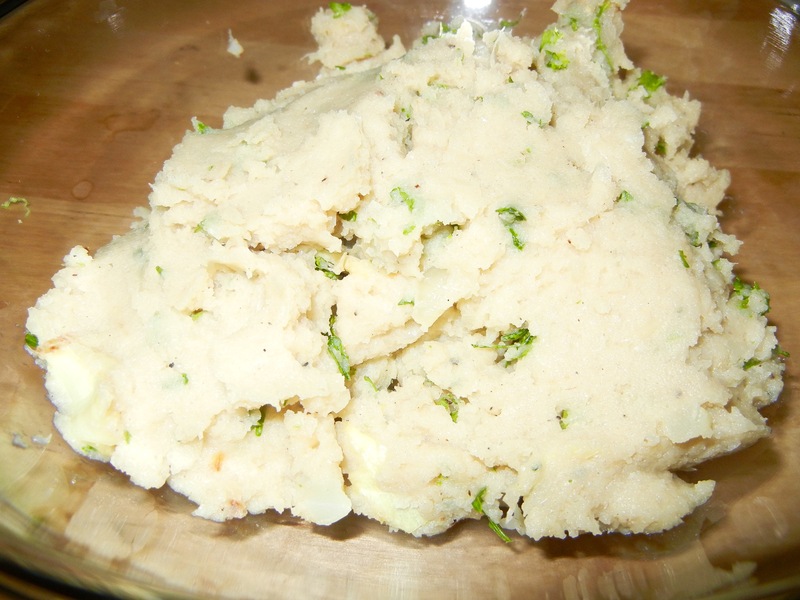 I decided to take the task on myself to create a lighter, yet creamy and delectable version of cauliflower mash. This is super easy and seriously will not disappoint. The heavy dose of garlic will be sure to keep any vampires or unwanted sexual advances very much away. Heat oven to 375F. Place garlic cloves in foil and either spray/drizzle with oil of choice (coconut/olive oil). Place on baking sheet and set timer for 45 minutes. 20 minutes into roasting the garlic, place chopped ½ of a small white onion that has been lightly tossed/sprayed with oil of choice onto the baking sheet and return to oven for the additional 25 minutes of roasting time. 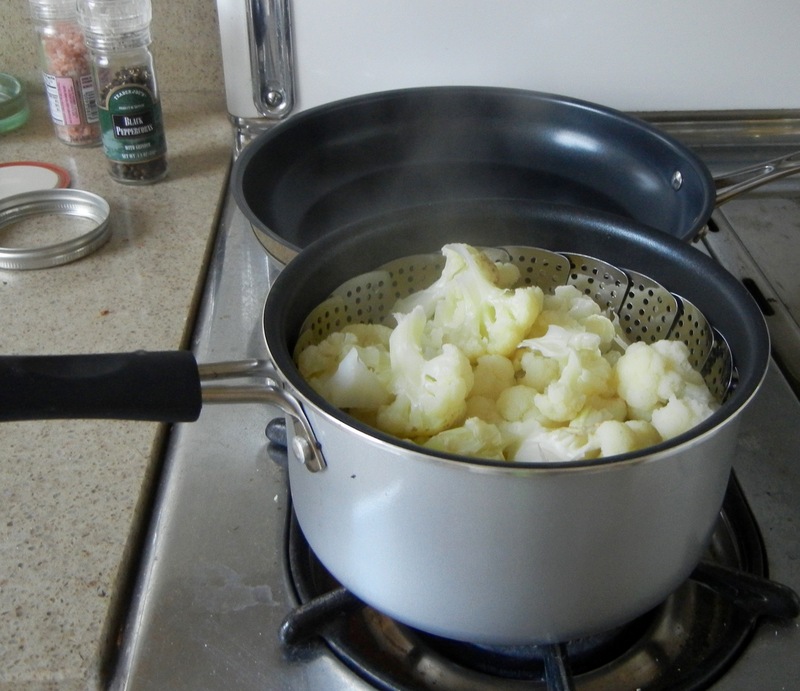 Meanwhile, steam your 4 cups of cauliflower. 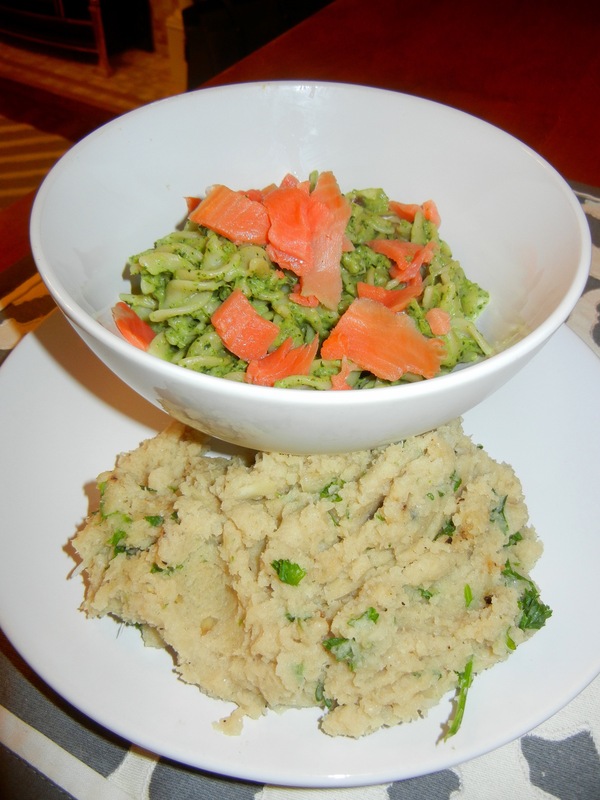 Once all veggies have been prepared, place them in a blender or food processor. Add in the 1-2 teaspoons of melted coconut oil, salt and pepper and optional garlic powder. Blend the mixture, slowly adding tablespoon by tablespoon of milk until a smooth consistency is reached. Finally, add in parsley and blend until parsley is roughly chopped and sprinkled throughout mixture. Knowing that California watermelon season is quickly approaching its end, I jumped on the opportunity to buy one when I saw a stand selling them this weekend at my local farmer’s market. I have a history of accidentally cutting myself with knives, so I let someone else do the major chopping and then began enjoying the fresh and juicy slices. Though watermelon is fantastic on its own, I wanted to mix it up and create a refreshing salad combining my farmer’s market produce. This recipe is single serve but can easily be doubled, tripled or multiplied tenfold for a crowd. It is light, refreshing, sweet and crunchy all at the same time. For a creamier bite, a sprinkling of crumbled feta on top is especially delicious. 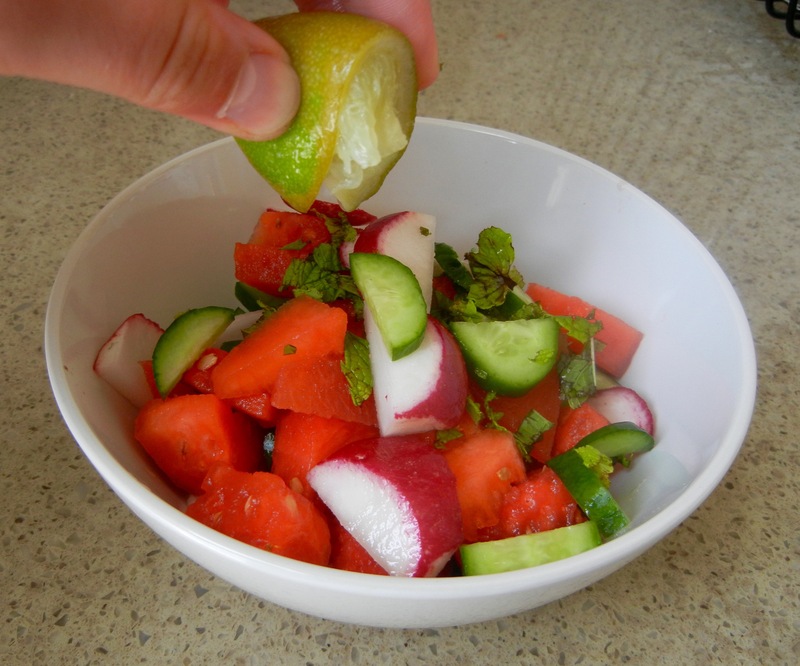 Cut watermelon and cucumber into ¼ inch chunks. 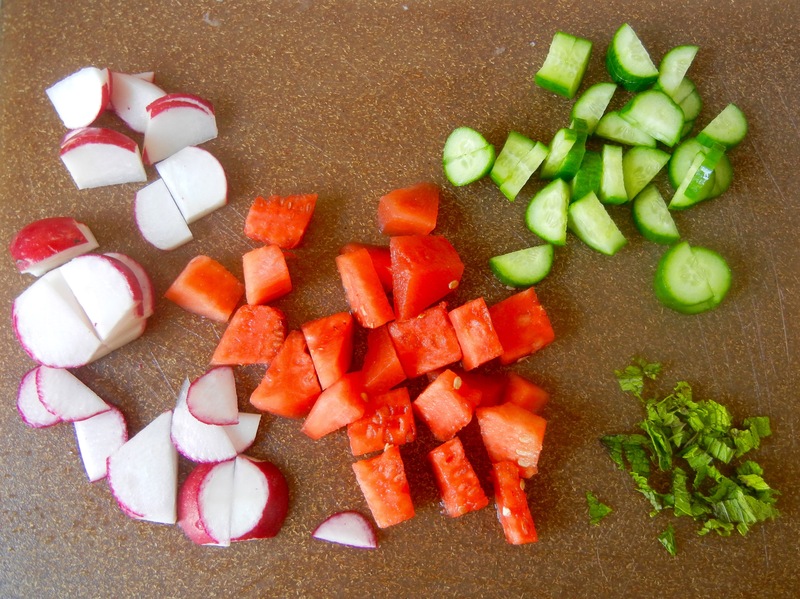 Either slice or dice radishes. 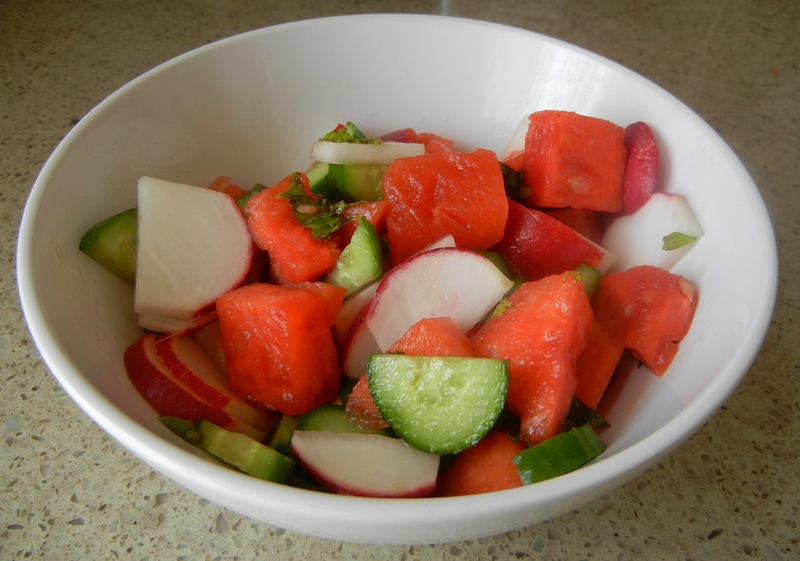 Place watermelon, radishes and cucumber into a bowl. Tear or chop mint leaves and sprinkle on top. 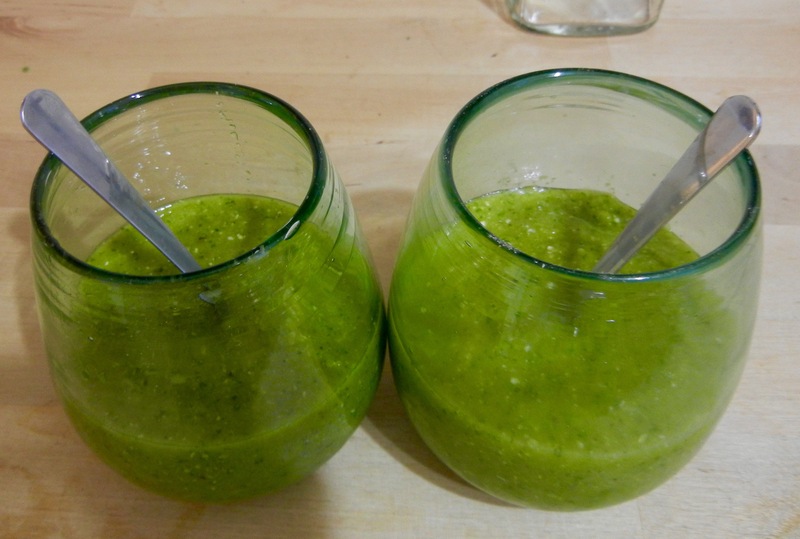 Squeeze juice from ¼ of a lime and drizzle ½ teaspoon of olive oil and apple cider vinegar on top of the salad. Add salt to taste and then toss to coat. For best results, stick it in the fridge for at least an hour. All kids love pizza, well, except for me. I never really loved pizza growing up. (Feel free to gasp now.) At birthday parties, I would eat a slice because that was what was being served, but what I was really excited for would be the ice cream cake- and that still hasn’t changed. Many years have passed since my bowling and movie party days, and somewhere in between I was diagnosed with gluten intolerance. Knowing that I couldn’t have pizza for some reason made me desire it more. I started to create my own modified versions of pizza and as I was making an omelet one day it hit me, why not use eggs as my base?! 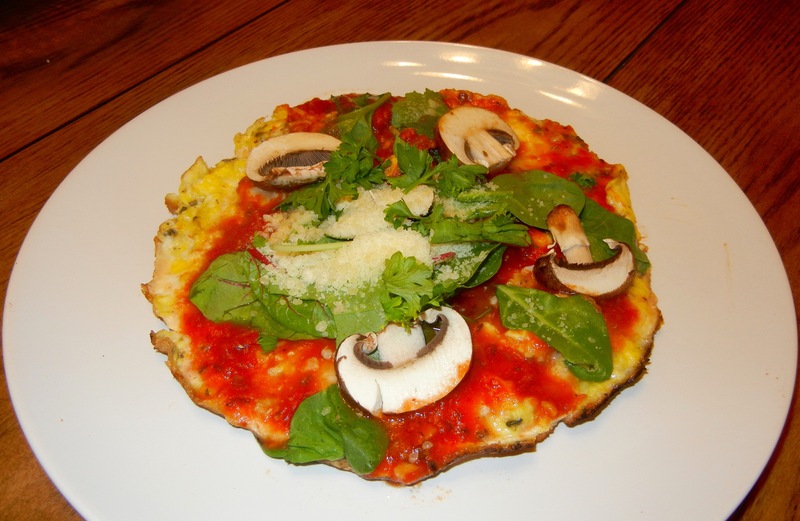 This healthified pizza is packed with protein, low in carbs, and totally customizable. It is super easy to whip up for a quick dinner/lunch any time of the week and uses items you probably already have hanging out in your fridge and pantry. Oh and it’s delicious and 100% male approved. 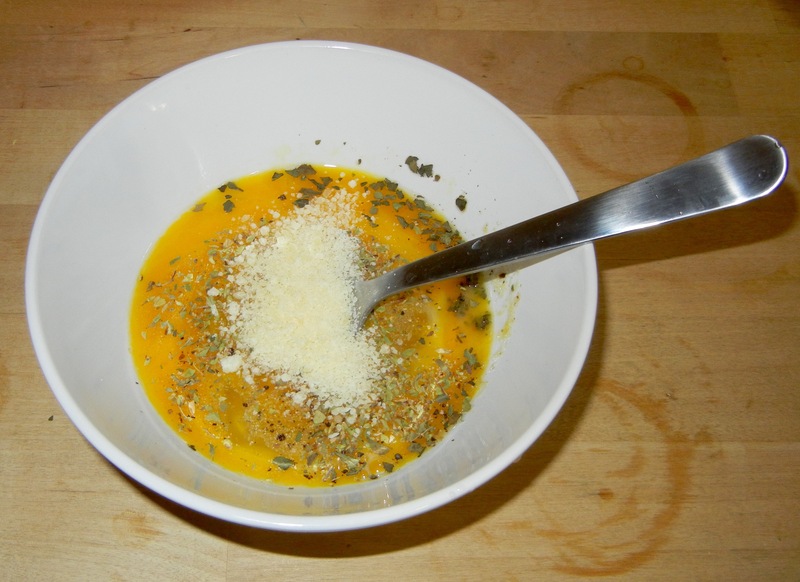 Whisk together eggs with spices and Parmesan/nutritional yeast. Heat a medium saute pan over a medium flame and cover with olive oil spray. Once thoroughly heated, pour eggs into the pan. 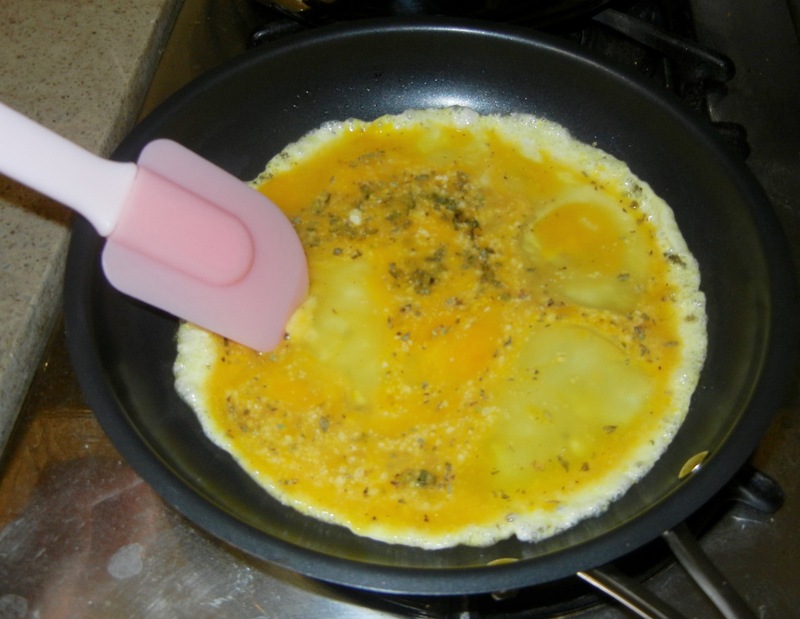 As if making an omelet, use a spatula to to push cooked edges towards the center while allowing the uncooked eggs to move outwards. 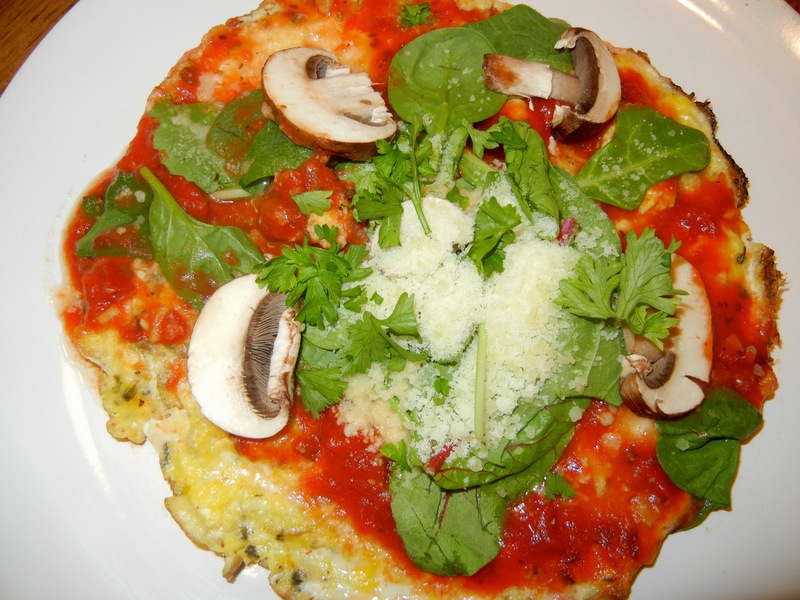 When the eggs are almost cooked, top the egg crust with your sauce cheese, spinach and other veggies of choice. 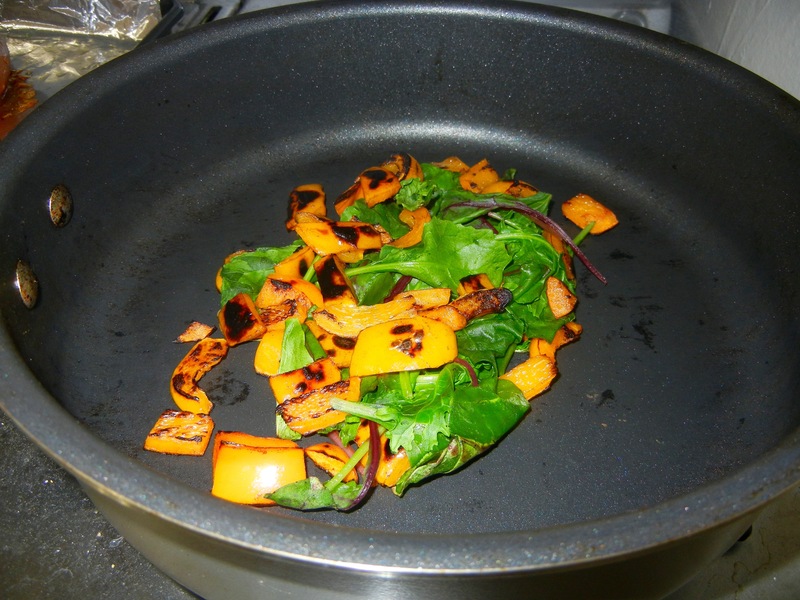 Cover pan with a lid for about 1 minute until cheese melts and spinach wilts. Slice up as you would a normal pizza and munch away! Tofu is a versatile and great source of plant protein. I don’t mind eating plain, straight out of the container, but I recognize for most that that’s just tasteless and plain weird. These little nuggets of crunchy heaven are totally customizable. Want them spicy? Add some cayenne or some hot sauce. Use any dried herbs on hand to accompany the dish you’re throwing them on top of. You can even make sweet versions using cinnamon and sugar. Now you’re thinking, what the heck am I supposed to do with these things? 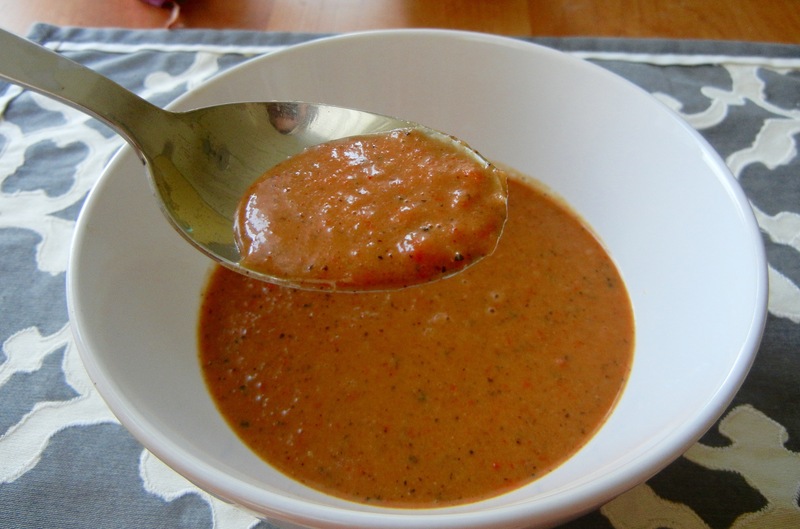 While they can be used for traditional crouton application like a salad and or soup like my caramelized onion and roasted red pepper soup, making them sweet means they’re a great topping for yogurt, oatmeal and more. Instead of nutritionally deprived bread croutons, these babies are low carb and high protein. They even make a great on the go snack- just don’t blame me for any strange looks you end up getting. Cut tofu into ¼ inch cubes. In separate bowl combine balsamic vinegar, salt, pepper and remaining spices. 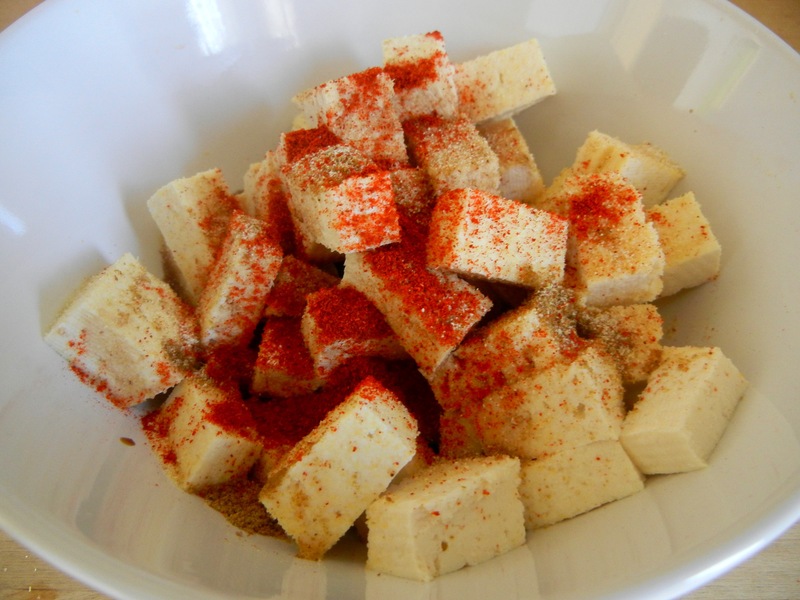 Place tofu in bowl and use a large spoon to stir to thoroughly coat the tofu without breaking up the cubes. Spray sheet pan with olive oil spray and place tofu on the pan. 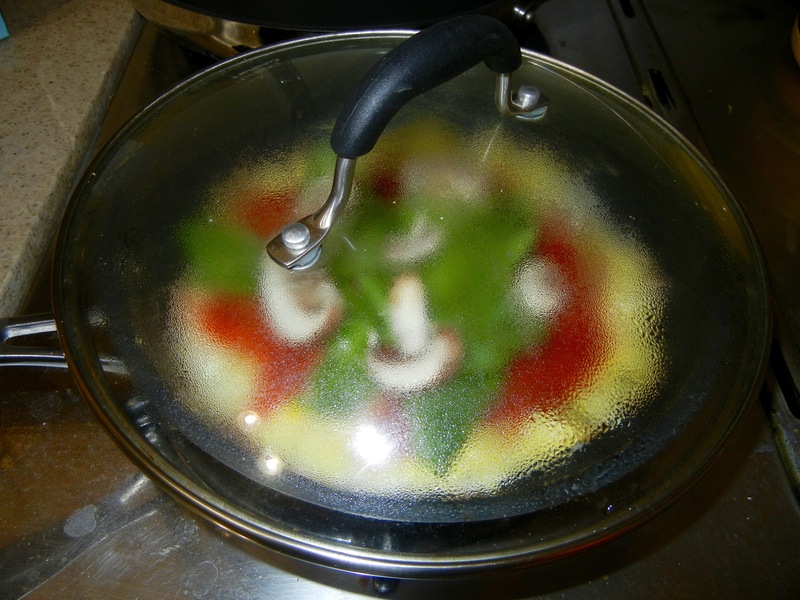 Spread tofu evenly on the pan and then use the olive oil spray again to coat the top of the tofu. Next, place the tofu in the oven for 30-35 minutes until golden brown. Finally, broil for 6-8 minutes. After the long weekend, it’s time to cleanse and refresh from our Labor Day festivities. Getting back on track shouldn’t mean having to spend hours preparing meals though. For anytime you want to detoxify, whip up a super easy recipe, or just want some refreshing and yummy soup, this one is for you! 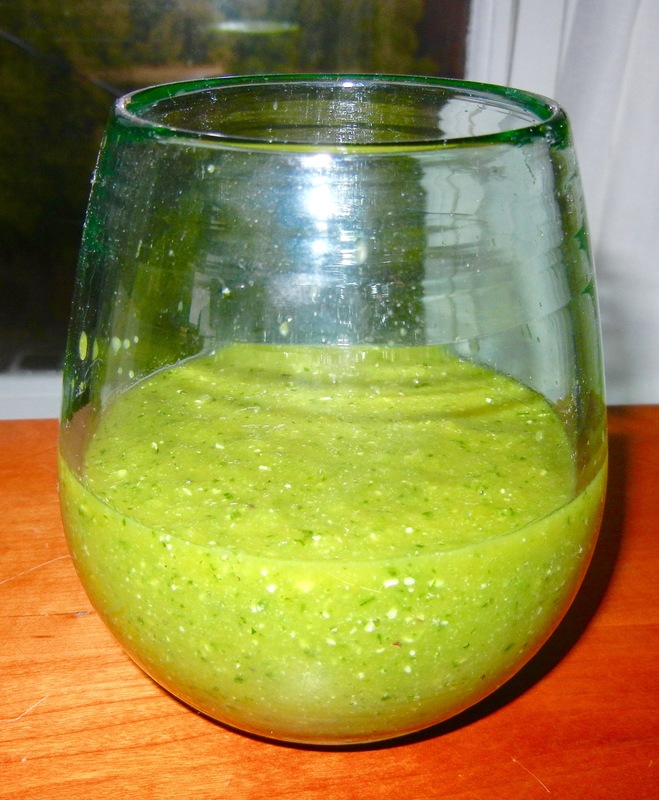 Detoxifying parsley as well as mint and lemon combine with hydrating zucchini to create this light and tasty gazpacho. 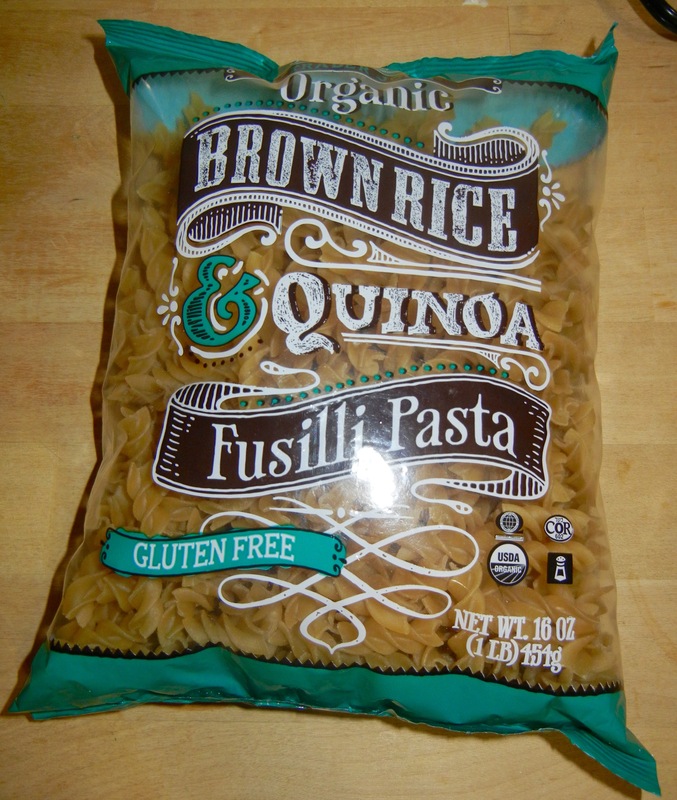 Per serving you’ll get 4 grams of fiber, less than 12 grams of carbs and almost grams 7 of protein for a mere 90 calories. Eat the whole thing and it’s still a snack! Enjoy alongside some cooked quinoa for a balanced vegan meal. Peel zucchinis and roughly chop. Peel garlic clove. Place all items into the blender. Blend until smooth. Place into fridge to chill for at least 1 hour. Serve sprinkled with additional hemp seeds if desired. Happy Friday before Labor Day people! Early tomorrow morning I am leaving for the weekend to go South to the beach, so for my road trip I wanted to be sure to pack some snacks. I hate having to stop at some gas station when I’m hungry only to find hostess cakes and Cheetos. To prevent these occurrences, I rarely ever leave the house without a snack, This gets especially interesting when I’m swapping out my purses and bags. While most are elated to find an extra 20 dollar bill in some pocket, I frequently come across packs of seaweed and nuts. Kale chips are a perfectly portable snack. You get the benefits of a dark leafy grain with the texture of a chip- what could be better?? For these l like to use a combo of olive oil and coconut oil. The slight sweetness of the coconut oil mixed with the great savory taste of the olive oil is a unique and tasty pairing. Feel free to experiment with your oils and spices to make your own unique creation! If using an oven, preheat yours to 375F. Rinse and pat dry kale leaves. Next, rip kale leaves from steam and tear up into pieces about 2 inches wide. Place teared leaves into a large bowl. I don’t care about your politics, either way spray the leaves liberally with both the coconut oil and olive oil sprays. If not using spray, use about 1 teaspoon each of olive oil and melted coconut oil and massage leaves to coat. Now it’s time to add your spices. Add all spices to the bowl and again toss to thoroughly coat the leaves and feel free to add more spices. If you are using your oven, place kale chips on a baking sheet and bake for 10-12 minutes until leaves are crisp and chip like. Alternatively, you may use a dehydrator. Place kale, without overlapping, on your dehydrator trays and dehydrate at 135F for about 3 hours. 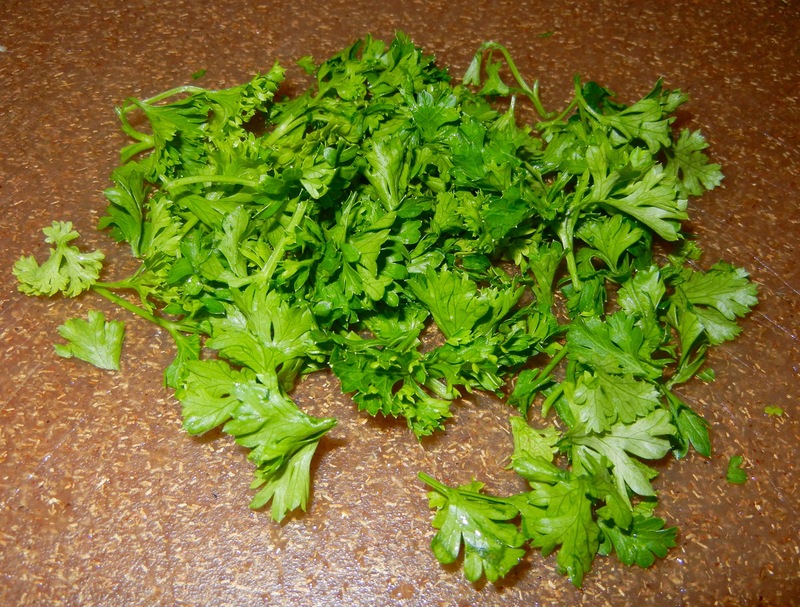 Once chips have been baked/dehydrated, place in a bowl and mix in the fresh parsley. For a quick fix you can even microwave the chips on full power for 2 to 3 minutes. Results will not be as crisp but will still taste yummy! Perks of working in the food industry include free food. While cheese and chocolate were more welcomed gifts, I still wasn’t going to turn down the offer from a coworker for a box of onions. Though it’s still summer, here in San Francisco, temperatures can be all over the place and nights get a bit chilly on most days. So I thought, why not make some soup? A bowl of soup can be comforting after a long day of work, and using up my onions means a win-win for my taste buds and my car that no longer smells like an onion patch. 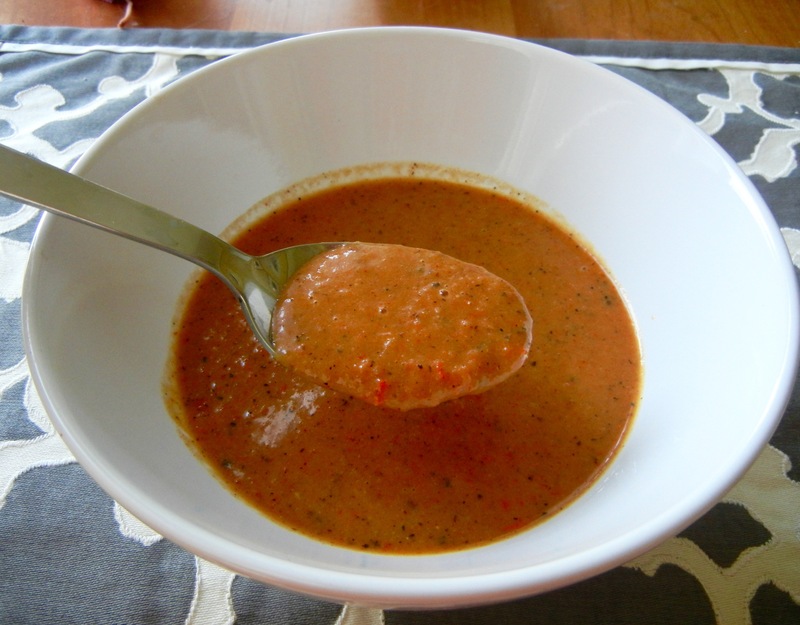 This soup is super simple to make and you can enjoy it hot or cold. Its thick consistency and robust flavor makes it both filling and delicious. Prepare ahead of time to enjoy throughout the week as a part of lunch or dinner or even as a snack. With 4 grams of plant-based fiber and under 130 calories per serving you can enjoy it at any time of day. Preheat oven to 350F. Slice bell pepper in half and remove seeds and stem. Once oven has reached desired temperature, place bell pepper halves on baking sheet and place in oven for 30-40 minutes until fully roasted. Meanwhile, peel and dice your 2 medium onions. Heat sauce pan with 1 tablespoons of olive oil and minced garlic. Once heated, add the onions. Occasionally stir onions so that they caramelize and don’t burn. When the onions are caramelized, turn off heat. Once onions and bell pepper are ready, allow them to sit to cool off for a few minutes. Next, add all ingredients including the vegetables into a blender. Blend all ingredients together, and then you’re done! If you prefer a thinner consistency, feel free to add more vegetable stock.